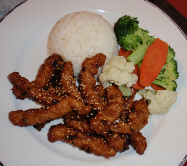 Deep fried chicken breast strips coated with orange sauce and sesame seeds. 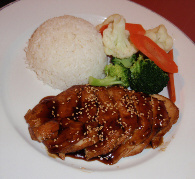 Grilled chicken breast or tender beef marinated with sweet & flavorful Teriyaki sauce. Served white rice and steamed vegetables. Spicy Fried Rice mixed with sauteed Veggies, Chicken, Beef or Shrimp. Non spicy Fried Rice is available upon request.